Musing to amuse on a washboard road. 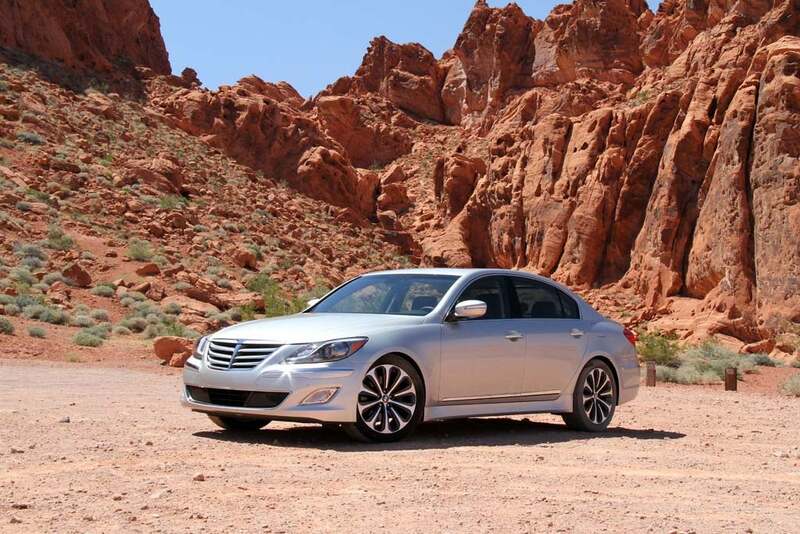 The Hyundai Genesis is a delight, says columnist McCluggage, until it hits a washboard road. I muse to amuse myself. Subject: What particular aspect of development in Asian cars trails European cars the most? I drive and I think. My decision: the suspension systems in Asian cars, specifically the fast improving Hyundai/Kia line-ups, are lacking in the sophistication of the European cars, most specifically the Germans. I’m thinking in particular about the ability of a suspension system to benefit a car with a smooth, comfortable ride that Americans consider a birth right and yet be able to follow the surface of the road closely enough to afford reliable grip and secure handling. I see this as making sure the four contact patches are always as much alike as possible. (A good way to drive, too.) Of course the patches swell and shrink as weight is shifted with steering, braking and accelerating, but any extreme variations means a car is not moving with balance. And dynamic balance, as in any sport, is a good indication of how you’re doing as a driver. Or a car as a driven. An engineer, which I am not (nor is a jockey a veterinarian), in designing a suspension system has to deal with a spaghetti-plate of contradictions. That good ride for instance means to most Americans something that renders the road surface distant and unobtrusive no matter what its condition. That can be done. But what produces that detachment counters any attributes that make for relatively flat cornering and road-holding. Counter intentions are hard to mediate. By the way (blogs are allowed by-the-ways) I define a harsh ride thusly: if a car runs over a coin the driver can tell it was a dime. A too-harsh ride is one in which the driver can tell where the dime was minted. So reverse here. We are with the Asian cars (generally) being not up to the Germans in suspension sophistication. There’s a dirt road near my house in Santa Fe over which I take my test cars comparing their ability to protect a passenger’s spine yet not to forget the direction they were intended to go. And no bottoming complaints please. My 1993 Suzuki Sidekick is fun to drive over that road; it hops totally sideways they hops the other way, rattles its little windows and shakes like Jerry Lee Louis. I swear at the road’s end it flashes a dusty grin and says: “Let’s do that again!” But not many others enjoy the Kicker’s extremes. Nor are they supposed to. The Koreans have come so far so fast I’ve got my stopwatch out to see how soon they’ll catch up to the German systems. Recently I took a new Audi A6 over my test road. I was like a duck in the driver’s seat, serene. Leaving tiny wakes on a glassy surface but below me flashing webbed feet were paddling fiercely. Or shift metaphors to a more appropriate one: the car was a champion mogul skier, upper body still as a whisper while knees pistoned away below to absorb the bumps. Driving can be skiing you know and the German cars are gold medalists in suspensions. Oh yes. Where do the Asians excel? Generally in reliability and lower cost of maintenance. This entry was posted on Monday, November 14th, 2011 at and is filed under Automobiles. You can follow any responses to this entry through the RSS 2.0 feed. Both comments and pings are currently closed.